In November of 2015, The World Health Organization released a report investigating how likely red meat and processed meats are to cause cancer. The Internet promptly exploded with headlines proclaiming ‘How your steak is giving you cancer’ and ‘Bacon is as bad for you as smoking’. Taking a step back from the attention-grabbing headlines, the real substance of the report was much less alarming. The meat and cancer report which generated so much public interest was prepared by the International Agency for Research on Cancer (IARC) – a group of 22 experts in their field from 10 different countries. The IARC serve to help guide advice on food and health given by the World Health Organization. Yes, the IARC did conclude that processed meat and also likely red meat are linked to causing colorectal cancer. Colorectal cancer (also called bowel or colon cancer) is the second leading cause of cancer death in Australians so the findings rightly did garner a lot of media interest. Yet even the highest level committee members of the IARC were not saying that if you eat a sausage you are a candidate for cancer. What they were warning about was that if processed meats were a daily feature of your diet, your risk of bowel cancer would go up. To put the risk in context, for every 50-gram portion of processed meat eaten daily (about two slices of bacon), this increases the risk of bowel cancer over a lifetime by 18 percent. What was surprising about the heated public interest in the report was that the findings were nothing new at all. For at least 10 years, the link between red meat, especially processed meat, and colorectal cancer has been well described. Peak cancer bodies such as the World Cancer Research Fund and the Cancer Council Australia have recommended people eat less red and processed meats for exactly the same reason of cancer risk. So the IARC report is more a new framing of evidence rather than a presentation of a new scientific finding. What is meant by red and processed meat? It may seem obvious what red meat is, but some white meats also count as red meat. Confused? Red meat is considered the muscle flesh that comes from cattle, sheep, pigs and goats. Pork looks white when it is cooked, but it is typically red when raw from its high haemoglobin content. Fish and poultry though are not part of the red meat family and were not linked to cancer by the IARC. Processed meat on the other hand is any type of meat (including poultry) that has undergone salting, curing, fermentation, addition of additives or smoking to enhance its flavour or improve preservation. Bacon, hotdogs, sausages, ham and salami all belong here. The IARC in forming their conclusions about red and processed meat and cancer took many things into account. They reviewed more than 800 published research studies that looked at the relationship between meat and cancer. These studies spanned several countries and continents with varying ethnicities and diets. A summary of their findings are shown in Figure 1. 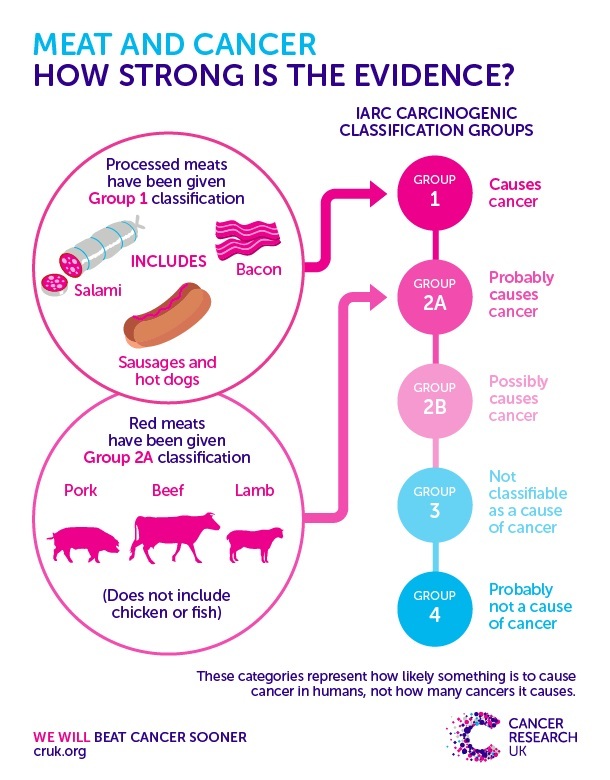 For processed meat, it was classified as Group 1 under the IARC classification scheme. This is the highest category and is used when there is sufficient evidence of a substance causing cancer in humans. The evidence for red meat and cancer was ranked one group lower. 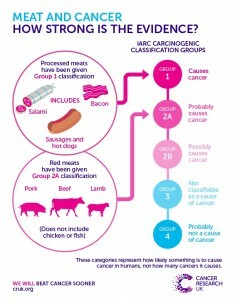 In this case, red meat was considered as ‘probably’ carcinogenic to humans, possibly causing bowel cancer. It was also linked to pancreatic and prostate cancer. Smoking and asbestos are also classed as Group 1 carcinogens by the IARC. Having processed meat in the same carcinogen group as smoking explained the alarming news headlines upon the release of the report declaring ‘Bacon is as bad for you as smoking’. These types of headlines work great for getting website clicks, but are very misleading. Just because something is linked to causing cancer, does not mean all such substances are equally dangerous. It is all comes down to risk. And the risk of developing lung cancer from smoking is far, far higher than the risk of developing bowel cancer from eating bacon. 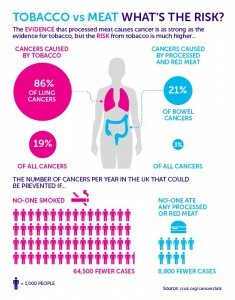 A comparison of the risk of cancer from smoking versus eating red and processed meat is illustrated in Figure 2. 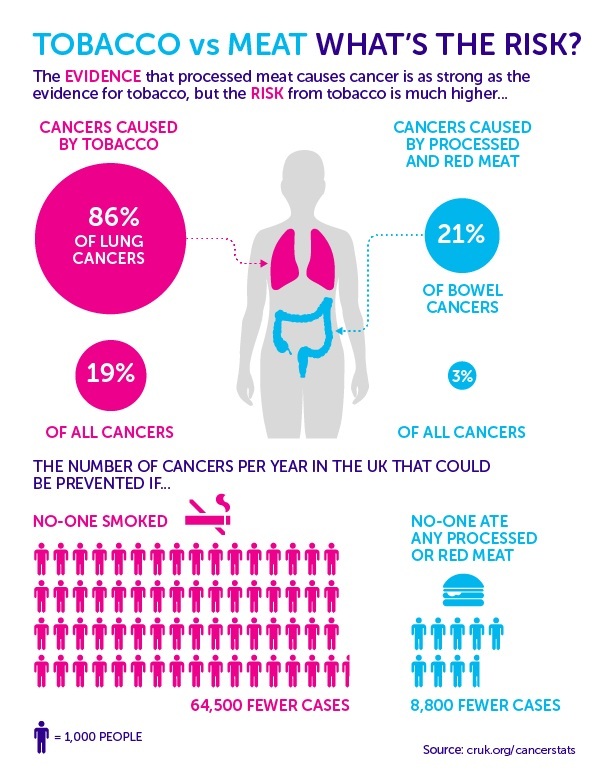 By far, smoking is the biggest explanation for most cases of lung cancer, while for bowel cancer, the relationship with meat is much lower. You can see the contrast in Figure 2 for how many cases of lung cancer could be prevented each year in the United Kingdom if people gave up smoking. Compare that to how many cases of cancer would be prevented if no one ate processed or red meat. Unlike smoking which has no health benefits, red meat is still a valuable source of nutrition so this should be considered as a counterpoint when discussing cancer risk. 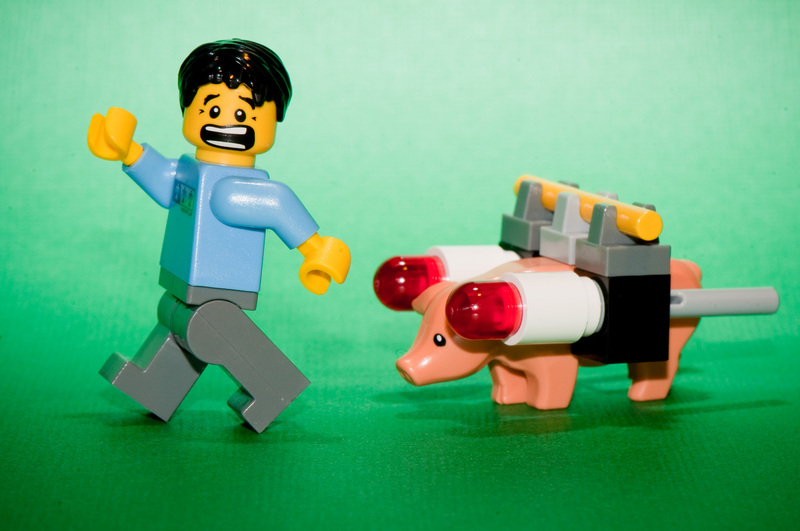 So what is it about red and processed meats that can make them carcinogenic? That is still an unanswered question, but several plausible culprits have been proposed. And the common theme among them is the damage they do to cells lining the wall of the large bowel. The first culprit is the pigment that gives red meat its colour: haemoglobin. In the gastrointestinal tract, haemoglobin can be broken down to a family of chemicals called N-nitroso compounds. These compounds have been found to damage the cells that line the bowel, causing them to divide and replicate more to repair the damage. It is this increased cell replication that increases the chance of errors developing in the cells’ DNA; errors which can be the first step on the road to cancer. Processed meats can have a double-whammy effect because they contain additional chemicals that are used as preservatives that can also make N-nitroso compounds. An interesting side turn here is that eating lots of green-coloured vegetables may lower colon cancer risk. The reason for green vegetables being cancer protective could be from the green chlorophyll molecule which is central to the process of photosynthesis. Chlorophyll is very similar in structure to the animal haemoglobin molecule. Chlorophyll may compete with haemoglobin or help eliminate it from the body before it has a chance to be converted into N-nitroso compounds. A second culprit could be the actual cooking process of red meat itself, especially grilling or barbequing. The combination of high temperatures and charring of meat produces chemicals on the surface of the meat that may increase the risk of colon cancer. One simple way to reduce the formation of these compounds is to marinate meat first. Think of it as a protective layer on the meat, but with the added bonus of extra taste. Yet another theory is that the iron in meat, so often promoted for its health benefit, could be a candidate for causing cancer. Iron is needed for a host of health reasons, but too much of it can place a higher oxidative stress (a process not unlike ‘rusting’) on the body, and damage cells lining the large bowel. With every media story reporting on a new dietary villain that causes cancer, it can make people throw their arms in the air and declare that “everything causes cancer, so why even worry about it?” The constructive message though is that there are many positive lifestyle habits that can lower the risk of a person developing cancer. The table following outlines some of these factors. And take note of how several of them are strongly linked to reducing the risk of colorectal cancer. When it comes to diet and cancer, it should be no surprise that fruits, vegetables and unprocessed grains and cereals come out on top as being the best ‘cancer preventing’ foods. While some foods may be promoted as being more beneficial, there is no one single ‘superfood’ that can prevent cancer; it is a combination of good eating habits and food variety that gives the greatest benefit. Physical activity is now recognised as a potent ‘cancer-preventing’ habit. Estimates link regular physical activity to a 20 to 40 percent lower risk of colon and post-menopausal breast cancer. There is also a potential benefit of exercise in lowering prostate cancer risk too. In addition to its cancer-prevention benefit, physical activity plays a large part in preventing heart disease and diabetes so the health benefits are multiplied. It is important to define what is meant by ‘risk’ to better appreciate cancer prevention guidelines. There is no such thing as something ‘causing’ or ‘preventing’ cancer – just raising or lowering a person’s chance of developing cancer. Cancer prevention through lifestyle changes are all about lowering a person’s risk, but there can never be any guarantees; however, sensible changes now will likely have positive benefits in the future. So is it game over for bacon and steak? No, not at all. If you choose to eat such foods, then there is no reason to now exclude them from your diet. Red meat is fine to eat in moderation. It is afterall a good source of nutrients such as protein, iron and zinc. It is just not having it all the time. The World Cancer Research Fund recommends eating no more than 500 grams of cooked red meat per week. And if you eat processed meat, really keep that to a minimum. Chicken and fish make excellent alternatives to red meat. Or you could even consider having more vegetarian meals in your diet. Choose a variety of cooking methods for your red meat too. Grilling and charring of food is okay occasionally, but consider lower temperature techniques like stewing at times. Distilling all the advice about reducing the risk of cancer with diet brings us back at some very uncontroversial basics. Eating plenty of plant-based foods full of fibre including fruits, vegetables, and wholegrains and not eating a lot of red and processed meat is the cornerstone of reducing the risk of cancer for everyone. Would appreciate an article on nutrition and prostate cancer. It’s hard to ignore such credible information. I’m new in the field of nutrition and am finding it overwhelmingly hard to know where to source credible articles, blogs, reviews etc on all things nutrition outside of peak body organisations. Given your background in scientific research and further credentials, I’d say you could be a trusted source. I love your blog, your infographics and the articles you link to, it’s helped me make important lifestyle changes. One question though, are fresh sausages from the butcher ok.? My butcher tells me they are not smoked, cured nor do they contain any salt just meat and spices. They also do not have preservatives meaning they must be eaten within 24 hours of purchase if this is relevant. It was handy to know that pork is a red meat btw, I thought it was the ‘other’ white meat. Thanks for your help. HI there Tena – thanks for your message and glad you get value out of the content I post. If all that is in the sausages you buy is minced meat and spices which it sounds like they are, then they would be considered as ‘fresh red meat’ and different to the processed meats outlined in the IARC report so enjoy! Thanks Tim for your article. Commonsense prevails after the media spotlight turns away to another fad, cure or outrageous statement.